Guest post by Raul Harman, Consultant and Editor in Chief at Technivorz . When I mention “artificial intelligence” or “machine learning,” the first thing that crosses your mind is probably humanoid robots. However, AI goes far beyond that. It represents an umbrella term used for sophisticated technologies, such as super-smart algorithms, machine learning, and natural language processing. The recent ISG report claims that businesses are starting to recognize the importance of AI. Even though only 16% of IT and business leaders have integrated AI into their mission-critical processes today, this number is expected to triple by 2019. Forrester believes that, by 2019, businesses will understand the idea behind the implementation of AI and its major challenges. According to them, firms will focus more on the pragmatic aspect of artificial intelligence and take creative approaches regarding its implementation. Artificial intelligence brings multiple benefits to companies within different sectors. The abovementioned ISG research emphasizes that AI will be critical to companies’ decision making, double their productivity, and help them minimize costs. And, one of the major niches AI has started to redefine is SEO. Want to learn how to use it to supercharge your SEO presence? It’s difficult to discuss SEO, Google, and AI without mentioning RankBrain. Out of the 2 billion searches Google manages every day, it sees 15% of them for the first time. So, how is it able to provide searchers with relevant results in such situations? This is where RankBrain, Google’s machine-learning AI system, steps in. It helps Google understand search queries and provide users with highly targeted results. RankBrain is not all about keywords. It analyzes concepts and tries to find content that matches these concepts. Precisely because of that, to rank high in the AI-oriented online landscape, you shouldn’t try to force your exact-match keywords repetitively when writing website content. On the contrary, focus on writing your content organically, to appeal to your target audience and bring value to them. When optimizing your content for your best-performing keywords, make sure you add them as naturally as possible. Parallel with the rise of AI, voice search has grown dramatically in 2018. Users love it because it is incredibly user-friendly. It lets them “communicate” with search engines in a more natural way and, at the same time, get the desired results faster and more accurate. As for keyword research and optimization, voice has added a new layer of complexity to this process. The reason for this is simple- when conducting voice searches, users don’t have to use short-form queries to save time. They can now talk to Google similarly to how they talk to their friends, asking full questions. This example also shows us that voice queries are usually focused on finding information about local businesses. This is why you should definitely optimize your site for local search. Let’s get back to the New York graphic design firm example. To align your keyword research with local searchers’ intent, our graphic design firm could, for instance, look for SEO services in NY. In this case, local agencies may help you tailor your strategy to your local audiences more effectively. Talk to them about creating comprehensive FAQ pages that are a great source of your question-based keywords. You should also focus on writing long-form content for that has a greater chance to match searchers’ queries. Remember Twitter notorious chatbot Tay? Yep, they silenced it because it couldn’t recognize offensive and inappropriate messaging. 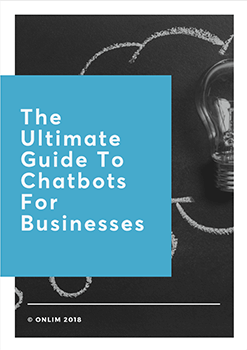 Even though many marketers still associate chatbots with spammy, intrusive, and completely pointless marketing tactics, the way these software solutions work has changed. Today’s AI-powered chatbots are smart. They’re constantly improving their conversation patterns and learning about your customers to provide them with more personalized experiences and pull them towards a conversion. A chatbot is not a business promotion tactic. It interacts with users actively, personalizes their conversations, and builds stronger relationships. It makes buying experiences smoother and more pleasant. Above all, it never sleeps. During your off-hours, a chatbot provides relevant customer support and helps your customers find the desired information faster. Precisely because of that, chatbots have become a fundamental part of every solid inbound marketing tactic. Gartner even claims that 85% of customer conversations will be handled without a human agent by 2020. Here are a few examples of brands using chatbots to increase user engagement and boost user experiences. Marvel Comics launched a super-cool Spiderman bot to boost excitement around its Secret Empire storyline. The Spidey chatbot gamifies user interactions, giving a user a nice nickname, providing them with multiple options to choose from and create their own narrative. Duolingo made an in-app bot that talks to non-native users in multiple languages and helps them practice their language skills. Whole Foods launched a foodie bot that lets users search for cool recipes and food inspiration based on their preferences. National Geographic’s Einstein bot talks to users just like Einstein would, helping them learn more about the famous scientist. The Aerie offers two product images, letting users choose the one that suits their preferences and body type. According to this information, a chatbot provides personalized product recommendations. The way chatbots impact SEO are multiple. First off, a chatbot is an invaluable source of customer information. It collects their feedback, tells you what their major problems and preferences are, and helps you adapt your strategy to them. Also, they boost user experience and help them find the right content faster. This will result in higher conversion rates and lower bounce rates, which are significant signals telling Google that you’re a relevant source of information. As a search marketer, you are a jack of all trades. There are numerous challenges you face every day, from monitoring your website performance in different data analytics platforms to learning more about user behaviors and to generating engaging content ideas to managing SEO budgets. AI-powered tools can process your online marketing data in a reliable and accurate way. It lets you make data-oriented decisions out of mountains of data. Deep learning can help you track market trends, audit site performance, analyze your major competitors, understand customer intent, and monitor your SERP performance. SEO consists of numerous repetitive tasks that don’t allow us to focus on the creative aspects of our campaigns. Unsurprisingly, your goal is to identify such tasks and automate them. For example, with the right AI-powered tools, you can automate your technical audits, keyword research, link building prospecting, content optimization, internal linking, etc. Personalization is key to SEO, as it allows you to create relevant and authentic experiences for each user. And, AI is a significant part of that process. By addressing your customers’ needs during the different stages of their intent, you will inspire them to convert or even buy additional products. This is exactly what sites like Amazon do. Namely, it uses AI to track users’ historical behaviors and provide products relevant to them. Google’s AI ranking factor, RankBrain, is changing the SEO landscape we currently know. Chatbots are humanizing brand-customer interactions and providing 24/7 customer support. Sophisticated CRM data helps us understand customer intent and make wiser decisions. Numerous AI-powered tools, from guest blog prospecting to reporting software, are helping us handle the manual tasks and focus on the creative aspects of our SEO strategy. So, we need to admit it. The era of AI is here. Therefore, implementing it with your SEO strategy is not optional anymore. It’s a necessary evil for all marketers that want to stay competitive in the AI-first era and supercharge their online performance. Raul is Consultant and Editor in Chief at Technivorz (https://technivorz.com/) , a website dedicated to all things tech related, written to cater to people for whom a dose of technology is as important during the day as breakfast, lunch and dinner.